I know I've run across a couple of blogs where photographers "collect" these. 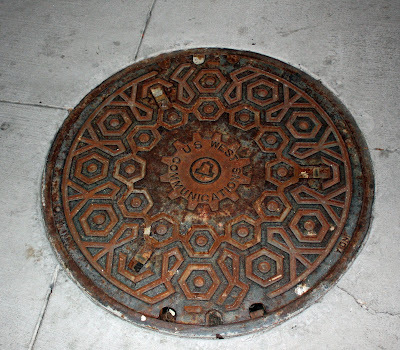 This is a utility access cover in the 8th Street Marketplace, downtown Boise. "U.S. West Communications" was one of the "baby bell" phone companies. It was taken over by Qwest Communications close to ten years ago. These "man hole covers" are scoped out by my daughter, who is looking for a fancy one, like the one in the movie "Enchanted." Her verdict on this one: not fancy enough for princesses. Apparently there are some artist designed manhole covers around here of late. I haven't seen one yet but I'm on the lookout, sort of. Maybe not fancy enough for a princess, but that's still pretty fancy! Don't you think that our photo blogs sharpen our eye and make us to be attentive to many things we've never looked before? I read somewhere these manholes are sometimes stolen because all over the world the metals are more and more expensive...So, mind the gap! Of course it's not fancy enough for a princess, that's why she is one. I think its pretty fancy. Its sure not something you would see new today. How interesting to put such 'art' into a manhole cover. Note to self: look down when walking.